How does a common event badge template look like? Usually it has a round form where something special is written or some cute image is drawn. But no one prevents you from creating custom rectangular event name tags as well. 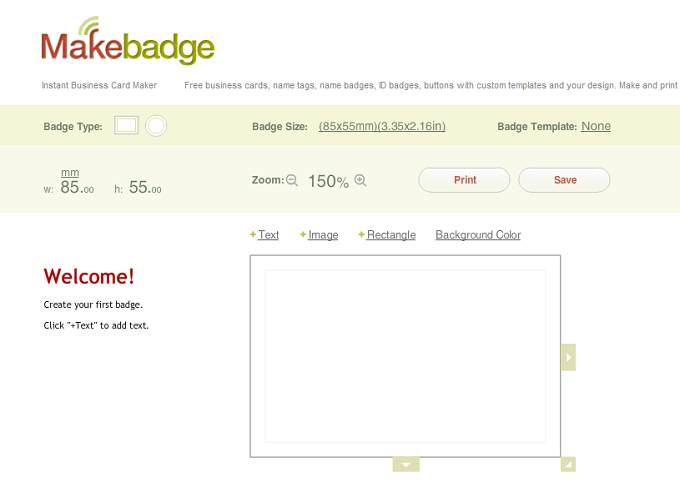 Use our MakeBadge online badge maker to design 100% free event badges right now! Event badges are also used to keep the existing customers and attract the potential ones. It’s a cheap but great way to make a small surprise for everyone! Besides, special convention name badges are one of the smart means to make your event remarkable within visitors and speakers. You don’t have to think it over, start MakeBadge app and create an event badge for your meeting step by step! 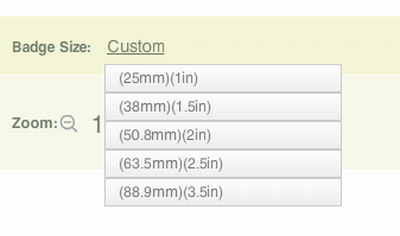 On the homepage of MakeBadge app, you’ll see 2 main template options. In the Badge type section switch between Rectangular or Rounded form of you event badge. If you need a circle shape for your convention badge, click the Badge Type – Round and then Badge Size link and select the most suitable size in the drop-down menu. 25mm badges are the most common size sold in the UK (roughly the diameter of a 10 pence coin). Like other types of name badges, event badges design may be adjusted according to your needs. 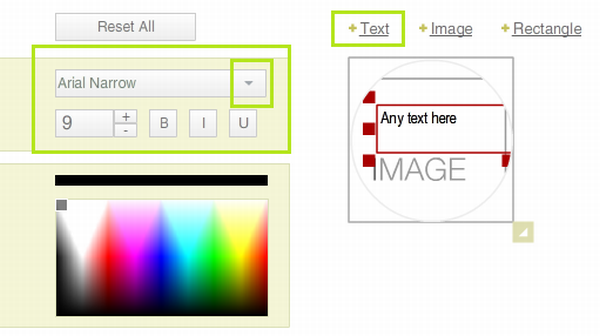 To customize your tag, use the Design options above the template: +Text, +Image, +Rectangular, +Background Color. Background Color lets you print full-color badges for meetings. One of the posh design solutions is to combine black and red. To upload an image, click the +Image link if you are going to fill the badge form with an image. 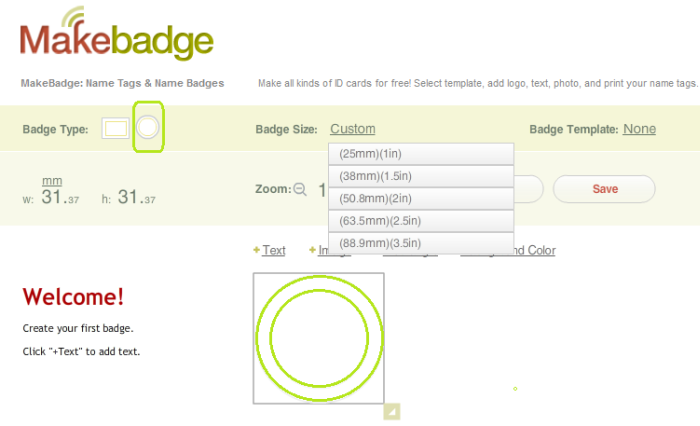 Keep your image dimensions small, but with good resolution, so MakeBadge badge maker can process it easily. For example, you can add a logo or event mascot using +Image option. To add some words, motto, or a convention theme click the +Text button. MakeBadge permits you to modify the font color, size and style any time. +Rectangular option is a good way to add a blank area, if you wish to write the name or some text, and specify its color in the side color palette. Thus, you can separate 2 areas of text. When you are done, click the Print button to get your event badges, or click the Save button to download your round event tag samples on to your computer. Why Should You Make Event or Convention Badges here? 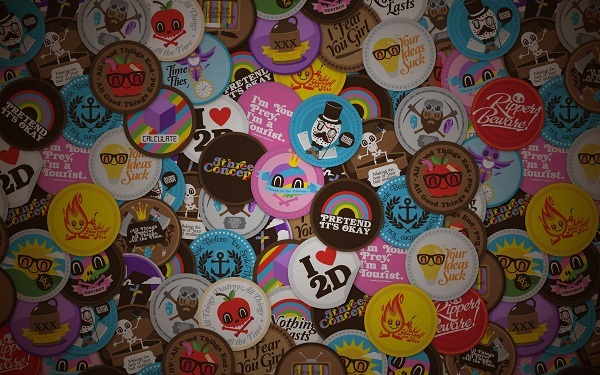 You can design and print small or big, round or square, practical and fashionable event badges! Your badges are free to create and they are a great giveaway for your customers. It’s an online fun to design great event tags for anniversaries, weddings, meetings, etc. Your printer delivers button event badges created via MakeBadge immediately! Get event badges with MakeBadge now!